When you draw, form is the important thing. But in painting the first thing is to look for the general impression of color….. Always paint a direct sketch from nature every day”. Jean-Léon Gérôme, via James Gurney’s book : ‘Color and light’. After the pierre portrait (English name : Peter), I had another realistic portrait commission : Anne (french first name), a little girl. As the previous portrait, I realized it on A4 Bristol paper (8.3 inch X 11.7 inch) with graphite pencil. I made this portrait from a photo. To draw does not simply mean to reproduce contours; the drawing does not simply consist in the idea; the drawing is even the expression, the interior form, the plan, the model. Look what remains after that! The drawing is three-fourths and a half of what constitutes painting. If I had to put a sign over the door of my atelier, I would write: School of Drawing…and I’m certain that I would create painters. 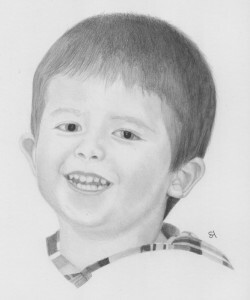 For Chritmas, a person commissioned me a realistic drawing of a little boy portrait. His parents did’nt want to publish on the web his picture and his name , and I understand very well. We’ll call this boy….. Pierre (a french name). This drawing realized with graphite pencil on A4 Bristol paper. I did this drawing from a photo sent by E-mail. I didn’t want to mark too the traits for a young child. On the other hand, my scanner doesn’t make shadows finest and sometimes you feel that my traits stop net. I assure you, this is not the case.